When you are sharing a document, you never open it directly (this is the job of the Datacentre server), but always Connect to it. This is true even if you are on the “host” computer. The first time you attempt to access a document on a Datacentre server you will need to do it by connecting, as described below. 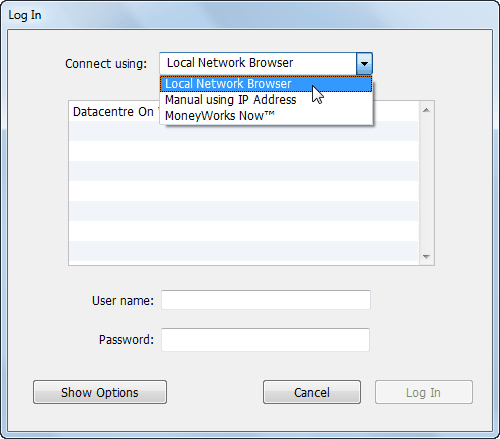 The connection will thereafter be remembered and displayed in the Recent Documents list on the MoneyWorks Welcome screen—provided you have opted to have your user and password stored in your keychain/vault, you can simply double-click to reconnect. Note that you can mix Macintosh and Windows clients and servers on the same network. It makes no difference if you are using a Mac and the server machine is running Windows, or vice versa. If your server is on the same local network: choose Local Network Browser. This is discussed in Connecting to the local network. If your server is on a different network: (for example, you are accessing it remotely over the internet), choose Manual Using IP Address. You might also need to use this if you are on the same network but Bonjour browsing has been blocked/disabled on your computer or the server by a network administrator. See Connecting to a document on another network for further details. If you are using the MoneyWorks Now cloud service: choose MoneyWorks Now. See Connecting to MoneyWorks Now.